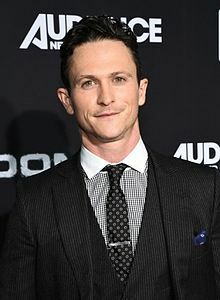 جاناتان توکر (اینگیلیسجه: Jonathan Tucker) آمریکالی اوْیونچو. ۳۱ مئی ۱۹۸۲ ‏ ایلینده آمریکادا دۆنیایا گؤز آچیب. 1997 Early Edition Tony Episode: "Frostbite"
2001 Practice, TheThe Practice Chad Baldwin / "James Tucker" Episode: "Vanished: Part 1 & 2"
2002 Philly Eli Wexler Episode: "The Curse of the Klopman Diamonds"
2003 CSI: Crime Scene Investigation Peter Arnz Episode: "Crash and Burn"
2003 Law & Order: Special Victims Unit Ian Tate Episode: "Abomination"
2004 Six Feet Under Bruno Baskerville Walsh Episode: "Falling into Place"
2005 Masters of Horror Jak Episode: "Dance of the Dead"
2006 Law & Order: Criminal Intent Drew Ramsey Episode: "Wrongful Life"
2010 White Collar Avery Phillips Episode: "Hard Sell"
2011 Criminal Minds Raymond Donovan Episode: "The Thirteenth Step"
2012 Perception Brady McGraw Episode: "Nemesis"
2012 Person of Interest Riley Cavanaugh Episode: "Triggerman"
اینگیلیسجه ویکی‌پدیاسی‌نین ایشلدنلری طرفیندن یارانمیش«Jonathan Tucker»، مقاله‌سیندن گؤتورولوبدور. ( ۲۲ ژانویه ۲۰۱۸ تاریخینده یوْخلانیلیبدیر). قارداش پروژه‌لرده جاناتان توکر گؤره داها آرتیق بیلگی‌لر تاپابیلرسینیز.